Polyclinic officials said they have finished the six-week process of moving a number of physicians and services from First Hill into Madison Center, its new nine-story building at Seventh and Madison, overlooking Interstate 5. The clinic has signs on the south and west side of the building. 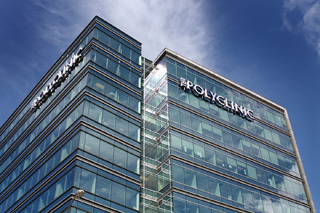 Polyclinic has doubled in size in seven years, with clinics in north and south Seattle, and near South Lake Union as well as First Hill. It employs about 200 health care providers. Officials said the real estate crash in 2008 provided an opportunity to partner with HAL Investments and get the empty 205,000-square-foot building for about half of what it cost to build. Patients will go directly to providers' offices rather than a central check-in. Imaging services such as MRI, CT scans and a new tomosynthesis 3D breast screening machine are available at Madison Center. Polyclinic Broadway still will house several medical practices and services, including endoscopy, breast imaging and the Ambulatory Surgery Center. Neighborhood clinics are not affected by the change.